A well-respected retired academic was recently trampled to death by cattle while walking in Oxford. In 2012, my father was hospitalised after being attacked by cows while walking his dogs through a field next to his village. He picked up his dog and was pushed to the floor and trampled before escaping over a wall. My colleague, Marie, meanwhile, is a keen cross-country runner, and regularly runs with her dog (or is chased) through fields where both dairy and beef cattle graze. These kinds of incident raise questions about the safety of the public near livestock. And we asked these same questions when we conducted research on this very topic. There are about 9.7m cattle in the UK. Meanwhile, 3.6 billion people annually visit the countryside, with dog walking accounting for 51% of visits. This means that the general public are likely regularly to encounter livestock. The drive towards healthy living and outdoor pursuits, footpaths crossing farmland, and the introduction of the Countryside and Rights of Way Act 2000 (CROW Act), which promotes public access to “open country”, all encourage countryside activities. At the same time, more and more people grow up in an urban environment, and may not have often experienced livestock. This could lead to more problematic interactions between people and animals. So how often do cattle attack people, and what proportion of attacks are fatal? Are there particular risk factors? 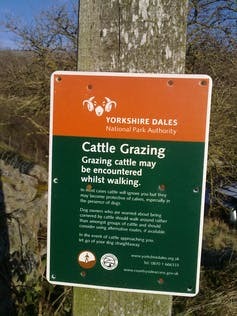 And what guidance is publicly available on how to behave near cattle? We searched newspaper reports over two decades, and identified 54 separate attacks by cattle on members of the public out walking. Of these, 24% were fatal. Injuries included fractures from kicking, lacerations, punctured lungs, bruising, black eyes, joint dislocation, nerve damage and unconsciousness. But how does this compare with official statistics? The Health and Safety Executive (HSE) reports deaths, not attacks. They say that on average four to five people are killed in accidents involving cattle each year, with 74 fatal attacks since 2000. Most were farm workers, but a quarter (24%) of these deaths were members of the public walking on footpaths or commonly used rights of way. The government agency also comments on the under-reporting of this issue, due to a lack of awareness of the need to report a cattle attack as a “workplace” injury. People may think that bulls are most likely to attack – remember the beginning of Ferdinand the Bull. But while they cause more fatalities among farm workers, both official reports and our work suggest that this is not the case for people out walking. Where recorded, 91% of HSE reported fatalities on the public were caused by cows with calves; only one death involved a bull, and even this was unproven in court. Of all attacks, we found that 48% were caused by (unspecified) herds, followed by single cows (22%), cows and calves (20%), heifers (7%), and one bull attack (2%). Behavioural research suggests maternal defensive aggression may be behind many attacks. Does having a dog make a difference? Yes: dogs look like predators, and they are even more threatening to dairy cattle than unfamiliar people. This is reflected in the data: 94% of walkers killed had dogs, and two thirds of all attacks involved dogs. Though our sample numbers were small, we also found evidence suggesting that women were more likely to protect their dogs, while men let them go – the recommended advice, which my dad did not follow. 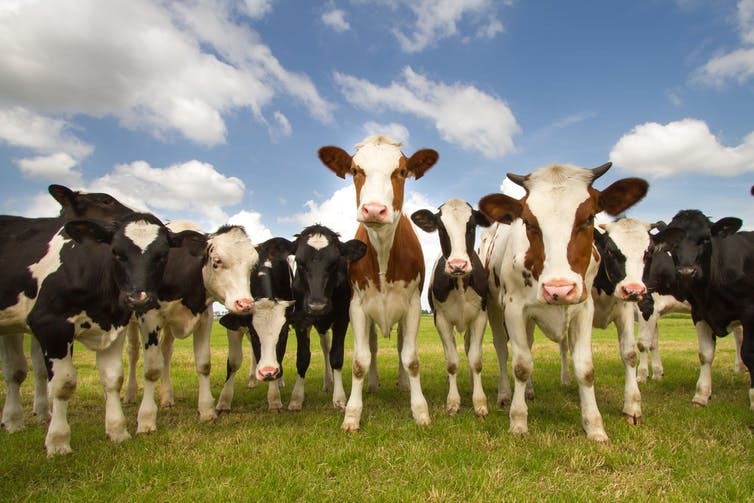 Does cattle breed make a difference? The HSE says not: the rate of fatalities did not differ for dairy and beef breeds. Both UK industries are highly dominated by certain breeds, such as Holstein and Aberdeen Angus, but farmers report that continental breeds, such as Limousin and Charolais are more highly strung. These are imported into the UK for beef production, and are likely to be more extensively farmed and handled less than dairy cattle, exacerbating any behavioural issues. So what advice is provided to the public about cattle? The countryside is a great place for exercise, including with dogs, but must be treated with respect. It’s every owner’s duty to make sure that their dog is not a nuisance to farm animals, wildlife or other people. It’s impractical to expect farmers never to keep cattle where the public can access, but the HSE advises that wherever possible, they should avoid keeping cows and calves in fields with public footpaths, and appropriate signage and protected walkways should be considered. They also highlight the main risk factors we mention, further noting that when stressed by the weather, illness or unusual disturbance, cattle can become aggressive too. We found wide variation in countryside guidelines for the public, but many reproduced The Countryside Code. One area lacking clear guidance is that of dog control near cattle. 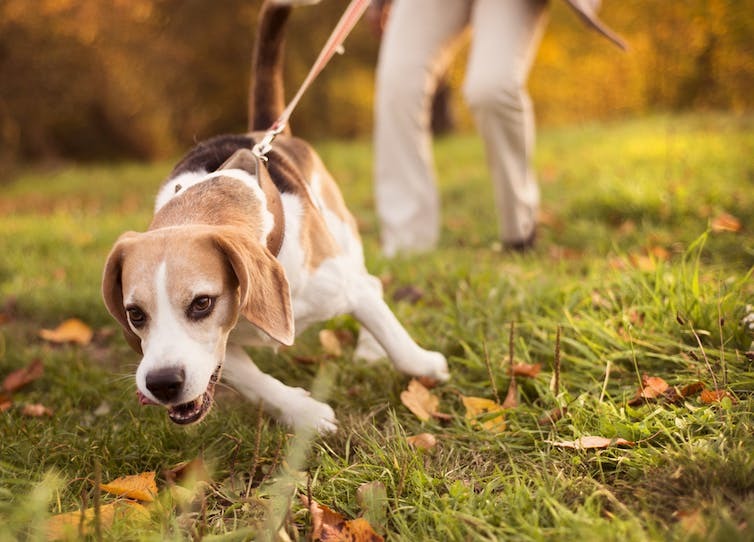 After a peak of attacks in 2009, the National Farmers Union began to advise keeping dogs on leads around cattle, but releasing them if chased or threatened. Interestingly, a new sign stating this eventually appeared in the place where my dad was attacked after more incidents had occurred. Fortunately, the only long-term effects for him were a bruised ego during family referrals to “Cowgate” and dogs who shake in fear of cows on TV. But what is the long-term future for cattle attack research? First, a well-designed, official system to document accidents is required; evidence for risk factors could then be properly assessed, and used to develop better guidance to reduce attacks. In the meantime, remember your dog can run faster than you – let it go.